For 1 3/8" pole. If you are looking for corner curtain rods, you have found the ultimate solution. Use for corner curtain rods or bay window curtain rod treatments. Kirsch's reputation for quality and elegance was built on Wood Trends. This swivel socket can be used to solve the corner curtain rod problem with fashion. Use to create bay window curtain rods. Save on 5 or more. Wood drapery rods. Use as swag curtain rod. Modern curtain rods. Kirsch's reputation for quality and elegance was built on Wood Trends. These classic styles in rich colors and subtle grains complement wood furniture finishes and architectural details, allowing for a totally original design statement. With a wide assortment of components such as elbow brackets, swivel sockets and holdbacks, Wood Trends is not only timely but also functional. Note: Some colors have surcharge added. 2 inch fluted wood pole, Wood Trends Renaissance collection. Wood drapery poles to dress up your windows. 4 feet wide, by Kirsch. Use as swag curtain rod. For 1 3/8" pole. Kirsch's reputation for quality and elegance was built on Wood Trends. These classic styles in rich colors and subtle grains complement wood furniture finishes and architectural details, allowing for a totally original design statement. With a wide assortment of components such as elbow brackets, swivel sockets and holdbacks, Wood Trends is not only timely but also functional. Front to back: 5 1/2"
Use with 1 3/8" wood curtain rods or design your own installation. Spring socket for making your own tension rod. Easy to mount rod in the bracket with flexable bending of the spring. Drapery hardware inside mount socket for 3/8 inch 7002 and 7003 rodding. 12 foot solid aluminum rod. Brass color. Window curtain rods for all windows. Note: Select Cut for shipping in the shipping options at checkout to avoid truck shipping cost when having rod cut to less than 105". Clearance 1", brass finished bracket for round 3/8 inch curtain rodding. Clearance 3/8", Brass finish. Use with 7002-12 or 7003-12 solid round curtain rods. Goosneck bracket for a finished look. Brass finish. This model has a 1 inch clearance. Use with 3/8" diameter rods, 7002-12-063 or 7003-12-063. Minimum 12 feet. Brass colored 12 foot solid steel rod. For extra long curtain rods. 3 inch projection wall mount or ceiling mount bracket for 1 1/2 inch diameter indoor or outdoor curtain rod. Includes hidden lock screw to hold rod. Use with C-Rings pass draperies by the support bracket. to Available in two colors in stock, ready to ship. It can be used indoor or outdoor. Use on those windows that face patio or pool area, or use inside on any window. Charleston collection by Design Elements. Corner curtain rod elbow that adjust 90 degrees to 180 degrees to fir bay windows or corner windows. 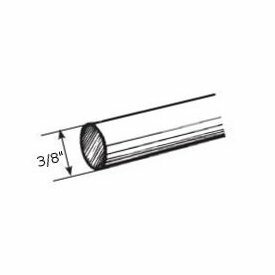 Fits 1 1/2 inch diameter indoor or outdoor curtain rod. Available in two colors in stock, ready to ship. It can be used indoor or outdoor. Use on those windows that face patio or pool area, or use inside on any window. Charleston collection by Design Elements. Colonial holdback for draperies and curtains. 5 by 2 or 4 inch projection. Renaissance Collection by Design Elements. Metropolitan modern curtain rod finial. Use with tab top curtains, eyelet curtains or pinch pleat draperies. 3 1/2" D x 4" P.